Ice in ice cream: A friend and an enemy! The ice crystals are formed from the water in the mixture as it freezes. Now you might not remember adding any water to your ice cream mixture! But don't forget: milk is 90% water and cream 60% water. So around 50% of our base mixture will in fact be water! And most of that water will freeze into many tiny ice crystals, firstly as the mixture is cooled in the ice cream maker and then later on as it's chilled further in our home freezer. Smoothness is the ultimate test of quality in ice cream. No matter what our other preferences, everyone wants smooth ice cream! And the single biggest influence on the smoothness of ice cream is the size of the ice crystals. And unfortunately for us homemade ice cream enthusiasts, keeping those ice crystals small is really difficult! Ice crystals vary in size between 1 and 150 μm, with the average being 25 μm. A "μm" is simply the abbreviation for a micrometer. And there are 1000 micrometers in 1 millimeter. So, yeah, even 150 μm is pretty small! When ice crystals are between 10 and 45 μm, we can't detect them and we perceive the ice cream as smooth. But when those ice crystals are larger than 50 μm, we can feel them with our tongues and the ice cream becomes coarse. So how do we keep those ice crystals between 10 and 45 μm and why is it particularly difficult in homemade ice cream? To find out, we need to understand exactly how ice crystals form and then grow when we're making ice cream. 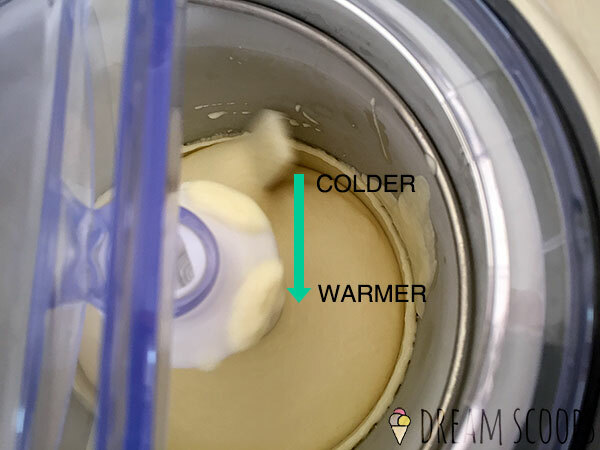 Ice crystals are only formed against the sides of the bowl in the ice cream maker. As the mixture cools, a thin layer of frozen mixture develops on the super cold sides of the bowl. This process of ice crystal formation is called nucleation. Then, as the dasher rotates, it scrapes some of that frozen mixture off the sides and moves it into the middle of the bowl. Here, the mixture is warmer and initially the ice crystals melt. But in doing so they cool the surrounding mixture. In time, the mixture in the middle of the bowl is cold enough for the ice crystals to survive and they grow into larger crystals as new crystals join up with them. This process is called ripening. Eventually, there are many ice crystals, evenly distributed throughout the mixture. But the ice cream maker isn't powerful enough to freeze all the water that needs to be frozen to make firm ice cream. So when the temperature of the mixture reaches around 21 °F (-6 °C), we transfer the ice cream to a freezer where the remaining water freezes. Again, there are no new ice crystals formed here. The water is attracted to existing ice crystals and when it joins them, it makes them bigger! The important thing to remember here is that ice crystals are only formed on the sides of the bowl. Once they've formed, they can only get bigger! Either when they join existing ice crystals in the middle of the bowl during churning. Or when they join existing ice crystals later on, in the freezer. There are no new ice crystals formed in the freezer! How do we keep those ice crystals small? Keeping the ice crystals small is all about freezing the mixture as fast as possible! Because the faster we freeze the mixture, the more small crystals will be created and the less time they'll have to join up and form big crystals. The colder the bowl, the faster the rate of nucleation. This means more small crystals. Which in turn means the temperature will fall faster and the mixture will freeze sooner. Ideally the bowl should be between -9°F to -20°F (-23°C and -29°C). Commercial ice cream makers use spring loaded dashers so that the blades are in direct contact with the sides of the bowl and can scrape off all of the frozen mixture. But in domestic machines, there's always a small gap between the blades of the dasher and the sides of the bowl. This means that there's always a thin layer of frozen mixture on the sides of the bowl that the blades can't reach. And since this layer insulates the rest of the mixture from the cooling effect of the compressor, it slows down the freezing process. Clearly the bigger the gap, the thicker the insulating layer of ice and the slower the mixture freezes. So we're always looking for the smallest gap possible in our domestic ice cream makers! As long as the compressor can keep up, the faster the dasher rotates, the more ice crystals are moved into the center of the bowl and the faster the temperature drops. In commercial machines, high dasher speeds can cause friction that warms the mixture. But domestic dashers spin so slowly this isn't an issue. The movement of the dasher also contributes to ice crystal size by cutting through the ice crystals and making them smaller. So powerful dashers with sharp metal blades are able to keep chopping through ice crystals even as the mixture thickens. The main problem with domestic ice cream makers is that they're under-powered. Whether they're freezer bowl machines or compressor machines, they simply don't have the cooling power or the churning power to freeze the mixture quickly. With freezer bowl machines, although the bowls will be cooled to between 0 and -22 °F (-18 and -30 °C) (depending on the freezer), as soon as the bowls are removed from the freezer they start to warm up. And with compressor machines, even though they're also able to cool the empty bowls to between 0 and -22 °F (-18 and -30 °C), once the mixture is added, the compressors aren't powerful enough to stop the bowls warming up considerably. And in fact, most domestic machines actually churn at between 5 and -2 °F (-15 and -19 °C). Most domestic ice cream makers are very under-powered! And don't forget this lack of cooling power is exacerbated by the layer of insulating ice that's left in the gap between the dasher blades and the sides of the bowl in all domestic ice cream makers! It's not just the compressors. The motors on domestic ice cream makers are also under-powered, so they're unable to keep churning the mixture as it hardens. And the dashers tend to be plastic with blunt blades that aren't able to chop up the ice crystals efficiently. All this means that while high powered commercial ice cream makers can freeze batches of ice cream in around 8 minutes, domestic machines can take up to 40 minutes! And of course this means homemade ice creams contain bigger ice crystals and are much less smooth than commercially made ice creams. What can we do to reduce freezing times in domestic ice cream makers? So as homemade ice cream enthusiasts, unless we spend a fortune, we're always going to suffer from under powered machines that will struggle to keep ice crystals small. The more "free" water there is in our mixture, the more water that's able to form and grow ice crystals. So use a recipe that minimizes the amount of free water in the mixture, by using lots of solids and some form of stabilization. If you're using a freezer bowl machine, make sure that the freezer's on it's coldest possible setting, that the bowl's been in the freezer for long enough to be completely frozen and don't remove the bowl from the freezer until the moment you're ready to start churning. Pre-cooling the bowl before we add the mixture is a must! If you're using a compressor machine, turn it on to pre-cool the empty bowl for a least 15 minutes before you add the mixture. This will ensure it's at the lowest possible temperature when you add the mixture. It doesn't matter how cold the bowl is, if we add a warm ice cream mixture to it, things are not going to go well. The mixture will warm the bowl, the freezing process will take an age and our ice cream will be very icy. I like to put the mixture in the freezer for 15 minutes before it goes in the ice cream maker. This is also the amount of time it takes for a compressor machine to pre-cool, so it works out quite well. If you try this and the mixture starts to freeze, a quick blitz with a hand blender will sort out any ice crystals before it goes in the ice cream maker. You can only really do this if you've got a Cuisinart freezer bowl ice cream maker, as in these machines, it's the bowl that rotates, while the dasher remains static. This enables you to reach into the bowl and eliminate the gap by pressing the blade against the side of the bowl with your thumb as the bowl's turning. The friction will add some extra stress to the motor, but not enough to cause any problems. For sure, standing there with your hand inside the machine for 20 to 30 minutes isn't much fun! And I don't think it makes a huge amount of difference. But it will certainly speed up the freezing time slightly so you may notice slightly smoother ice cream. 5. Choose your ice cream maker wisely! To be honest, there aren't huge differences in the amount of time that most domestic ice cream makers take to freeze the mixture. But what differences there are, definitely effect the smoothness of our ice creams. So choose your machine wisely! But don't think that spending loads of money on a fancy compressor ice cream maker will give you smoother ice cream than you'll get from a cheap freezer bowl machine. The Cuisinart ICE-21 freezes faster than most domestic compressor machines! Because in most cases, the cheap freezer bowl machines from Cuisinart, freeze the ice cream as fast, if not faster than all but the most expensive Musso compressor machines. If you want the smoothest ice cream you can get, according to your budget, check out my guide to choosing the best ice cream maker. While ice is an essential and welcome component of ice cream, providing that magical coolness and a lovely firm texture, we must keep the ice crystals small! If they're too big, they become detectable by the tongue and ice cream looses that smoothness that's so important and becomes coarse and icy. And the problem is that small ice crystals love joining up with each other to become bigger ice crystals! For homemade ice cream enthusiasts this is particularly challenging, as we're severely limited by our under-powered domestic machines. However, by using recipes that limit the amount of free water in the mix, by pre-cooling our machines and our mixtures thoroughly and by choosing our ice cream makers wisely, we can limit the size of those ice crystals to make super smooth ice cream! 2. Hartel, R. W. (2001), Crystallisation in foods. Gaithersburg, MD: Aspen Publishers. 3. Cebula, D. J., Russell, A. B. (1998), Ice crystallization control in ice cream. BuchheimW, (ed). International Dairy Federation international ice cream symposium. Proceedings of the international symposium.